This morning I had the privilege of speaking at the GeoWeb conference in sunny Vancouver. The conference looks again very promising, but that is not my subject today. Rather, I am writing about what I did before arriving in Vancouver: just to make this trip a bit more challenging, I decided to fly in a little early, visit Seattle and Victoria, go hiking in Olympic National Park, and try to take a few interesting pictures along the way. If you've ever done any backpacking, you might spot a little logistics challenge here: I need enough photo gear for serious pictures, enough camping gear to survive a few days in the wild, and clothes that won't look entirely out of place at the conference. Obviously I'll be flying in and out, and once there I'll travel only on foot and public transport, as I'm allergic to cars, so I can't take more than I can comfortably carry on my back for days on end. Not trivial. Below is my solution: everything I'm packing plus the bags I'm carrying it in, photographed and listed in no particular order. If you've ever had to sit on your suitcase to close it, or felt miserable carrying too much stuff on a long trip, I hope you'll find a few useful things in there. By the way, I am not listing exact model references because I think the general equipment choices are a lot more important than the precise models and brands bought. However, if anyone's interested in exactly what those items are and the rationale behind them I'll be glad to add that information. 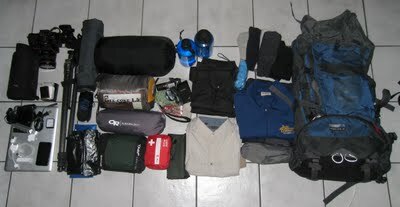 The backpack is a 75+10 liters model, definitely on the roomy side although larger ones certainly exist. On planes and city trips, the day pack holds my wallet, passport, photo gear and laptop, while everything else goes inside the backpack. While hiking, I'm using the trekking poles and the tripod gets lashed to the exterior of the backpack, freeing enough space to empty the day pack inside it and carry everything in reasonable comfort -- or at least that was the plan. I'll post a follow-up in a few days about how well it all worked.